/bɑs ˈtjɛ̃ no ˈse ʁɑ/ (hadess) | News: Simplez! Simple Pairing support now in gnome-bluetooth. I feel this blog entry would be improved if narrated by a Russian Meerkat. plaes: How about bugzilla? Fixed those. Mikko: 6 digits because that's what's recommended by the Bluetooth specs. 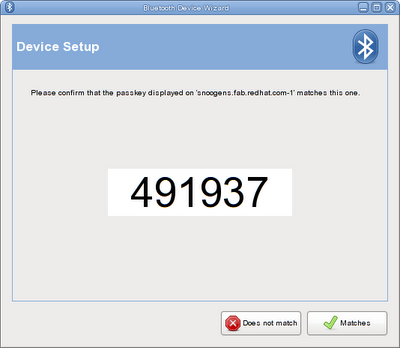 gnome-bluetooth doesn't create those PIN codes for SSP anyway, BlueZ does.